My mum is Japanese but she likes Western/European films and literature. So naturally children’s books and films she got for me were mostly Western/European classics (but translated in Japanese), such as Curious George, Barbapapa, The Secret Garden and Anne of Green Gables. Pippi Longstocking is definitely without a doubt one of my childhood favourites and one of all-time top 5. Having said that, I must to confess that I had never read the book by Astrid Lindgren until now. The Pippi, who sparked mischievous, tomboy nature in me, was from the 1969 film adaptation. I must have been 4 or 5 when I watched the film, so only lingering images of her were her carrot-colour plaits, freckles, and her lifting up her horse by her bare hands. So, when I read Pippi Longstocking (I’ve got one whimsically illustrated by Lauren Child) for the first time, it was a massive delight to find it was packed with delicious sounding food and Pippi’s love for baking because I’m a baking enthusiast myself. Suddenly I found myself flooded by all those possibilities of what to illustrate for my Food From Books project! But at the end, I picked pancakes and gingersnaps. 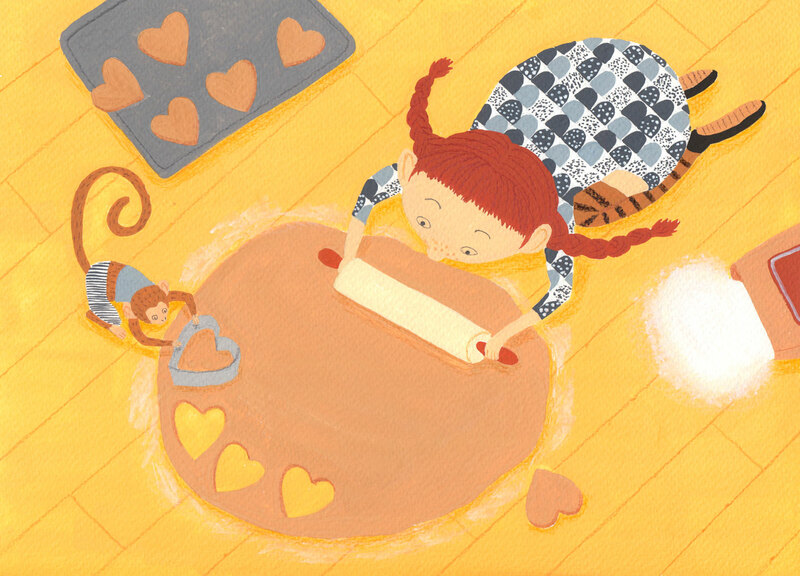 When Pippi met Tommy and Annika who lived next door, she invited them to breakfast and made pancakes. What a brilliant way to make friends! But I must say she was the messiest baker I’d ever heard (or rather ‘read’)! She tossed eggs high in the air, caught them in a pan, made the pancake mix in the pan and cooked it. An egg ended up on her head, but that was fine – it’s good for your hair, Pippi said. I can totally imagine how shocked her new friends were. I’m a bit OCD baker so if I see her messy kitchen, I’d be flipped. But (to my surprise) Tommy and Annika thought it was a very good pancake. Actually, beyond logic, how she bakes sounds just so exciting and fun! The book are about fun stuff those three friends did. They are often associated with food. For example, a coffee time on a tree, a picnic feast (‘delicious little sandwiches with meatballs and ham, a whole stuck of pancakes with sugar, several pieces of little brown sausage, and three pineapple puddings’), a mid-night snack with burglars, and a tea party with ladies! It wonderfully illustrates that food is a big part of childhood. So, reading Pippi Longstocking brought me back many of my childhood memories. The book was a treat!